Security house checks, security surveys, operation ID and temporary handicapped parking permits for the community and residents of East Greenwich. Standard police forms, documents and information regarding but not limited to firearms applications, handicapped parking and alarm registration forms. Take a look at, and find some answers to the departments most frequently asked questions by the East Greenwich Township community and residents. 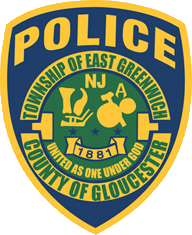 Thank you for visiting the East Greenwich Police Department Website. Here you will be able to find essential information for public services that our police department offers our residents. You can also find information throughout the website about crime prevention, the department's units and even learn more about our Police Explorers program for resident youth.